With football season already starting, you have probably already lost the battle for the remote as your family watches Frozen or some other Disney movie during football coverage on Saturdays and Sundays. Thankfully, there is an answer to your problem at hand and it comes in the form of basement remodeling. If your basement is not exactly somewhere that you like to visit, now is the perfect time to change that. With the football season only a few days old, you can easily contact a basement remodeling company to rehab your basement with plenty of football left to enjoy. 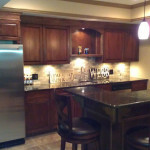 Basement finishing companies like RS Basements specialize in basement remodeling and can take your job from design to implementation in a short time. Below we will go into what constitutes the perfect man cave! So you’ve decided to hire a basement remodeling company to turn your old, drab basement into something that you’ll want to show off to friends, but you are not sure where to start. Take a look at this list of must haves that should be a part of every basement finishing project. Comfortable Seating – No man cave is complete without comfortable seating for you and your friends. This includes plush chairs or couches with ample cup holders for your beverage of choice. If you really want to improve the viewing experience, you can talk with your basement finishing company about adding stadium seating to give your man cave a theater look and feel. Multiple Televisions – Gone are the days where one TV was enough for your basement remodeling project. With scores of college and NFL games on at any given time, it is important to be able to watch multiple games at once. Ensure that your basement finishing plan accounts for multiple TVs. This will likely require multiple television receivers from your cable or satellite provider. Plenty of Fridge Space – No one wants to have to climb the stairs to get a refill on their “cold beverage.” Make sure that you set aside plenty of space for a fridge that can stock more than enough of your favorite iced beverage. While a basement remodeling project does not usually include waitstaff to bring you your drinks and snacks, with RS Basements we can literally put everything within arm’s reach! Memorabilia – No matter who your favorite sports team may be, start gathering all of your memorabilia for when your basement finishing project is complete. Every man cave should have plenty of memorabilia displayed to show where your true allegiance lies. Thankfully, we are only a few weeks into the regular season for both NFL and college football. You have plenty of time to complete your basement finishing project before too much time passes. Give us a call today at 770-889-2994 so that we can give you a free estimate to turn that basement into your favorite place on earth!